Opening is Friday April 12, 5-8pm, show continues Saturday 10am-5pm & Sunday 10am-4pm. Texere in Latin means to weave or intertwine, referring to the binding of fibres into cloth. 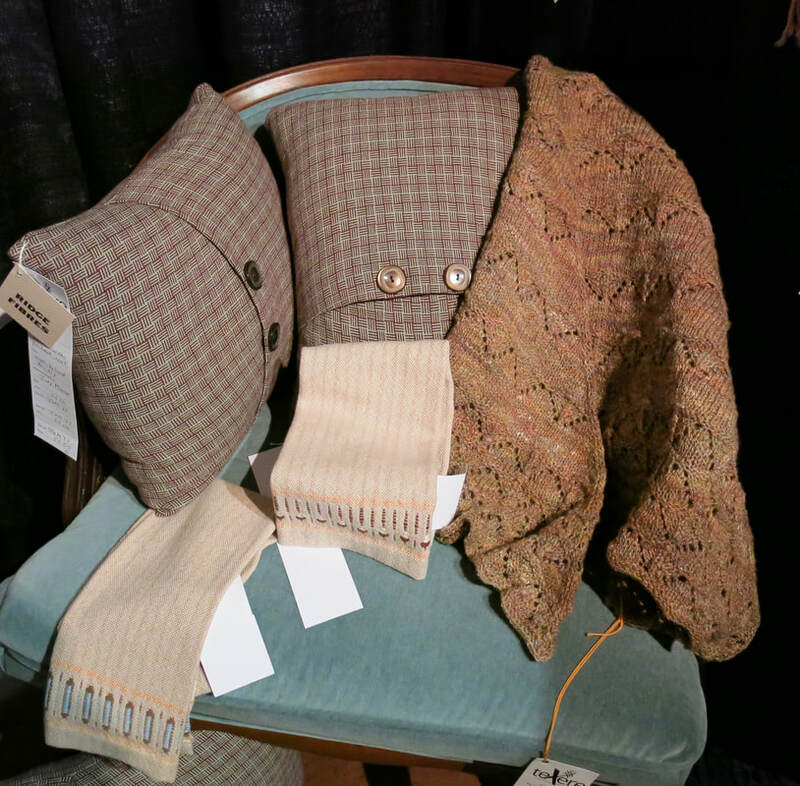 Texere is also an exhibition and sale of fibre artistry, hosted by the Victoria Handweavers & Spinners Guild. The Guild is excited to host its premiere weekend event, showcasing the diverse talents of our fibre community. For the first time in ten years, they display their wares as a solo group. The Guild has a fascinating past and vibrant future, according to Texere committee members. Doing research into the Guild, they found stories in the Times Colonist dating back to 1934. In recent years, there’s been a resurgence in fibre arts. The Guild offers mentorship and support through monthly meetings and casual drop-ins. A lending library, access to looms, workshops and a newsletter build up skills and knowledge. The members demonstrate their craft at community events like the Spin In, Fibrations, the Saanich Fair and Metchosin Sheep Dog Trials. Four Guild members are featured below. Arlene Kohut's woven towels on display. Arlene Kohut at her loom. 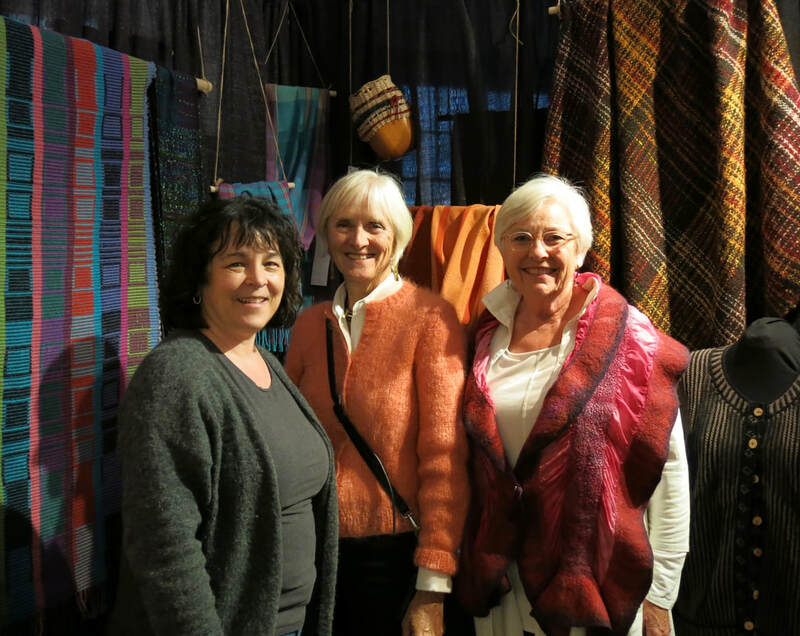 Arlene Kohut discovered weaving during an Oak Bay Studio Tour. Her first teacher was Jean Betts, a local weaver who studied textile design in Japan. Constantly learning and experimenting, Arlene has recently woven a two by three foot carpet. Annabelle, enjoying weaving at a young age. Annabelle completed her lovely scarf in no time. Her parents decide to buy her a loom of her own. “I learned how to warp the loom from Youtube videos,” says her mother. The photo shows Annabelle wearing her first creation, while working hard on her second - a shawl. The talented and determined youngster picked the colours and chose the design herself. Spin In Feb 23, left Diane Gray, right Johanne Byskov. Diane Gray has been a member of the Guild since 1985. “The knowledge base of the guild is phenomenal,” she says. 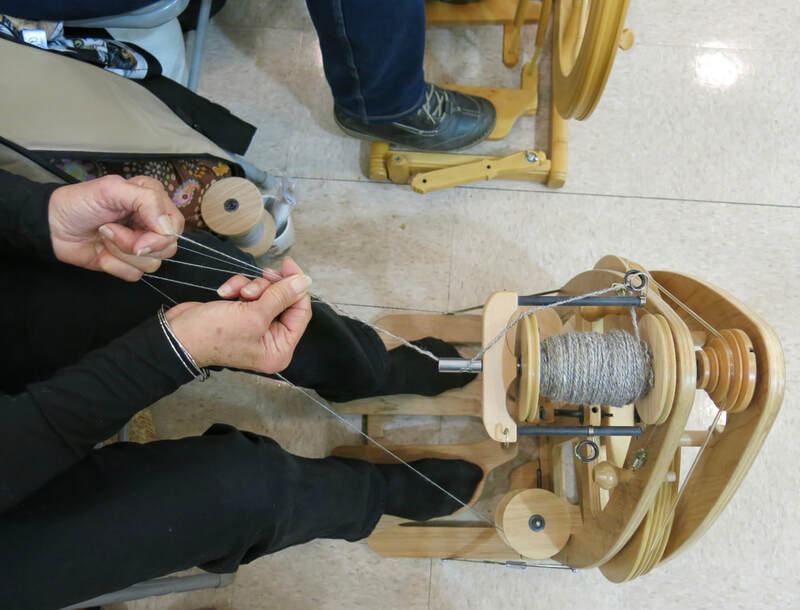 “I have learned so much, and now can share my skills with others.” Diane’s first spinning wheel was a gift from her uncle in the late 1970’s. Honoured to receive his hand-built gift, she decided to learn how to spin. In 1980, she took lessons from Judith McKenzie at Fan Tan Gallery. The photo shows her latest knitting project - a honeycomb cabled sweater. She spun the yarn herself, using hand-dyed wool rovings. Diane used indigo blue dye, a natural colour prized for centuries. The variations of blue tones in the sweater add visual interest. “The amount of hours that go into one item of clothing is incredible,” says Diane. She estimates that 50 hours of spinning are required to make yarn for one adult sweater. Then there is the knitting time to add on. It's a good thing that fibre artists are a social group. They love getting together to spin yarns and weave away the hours. 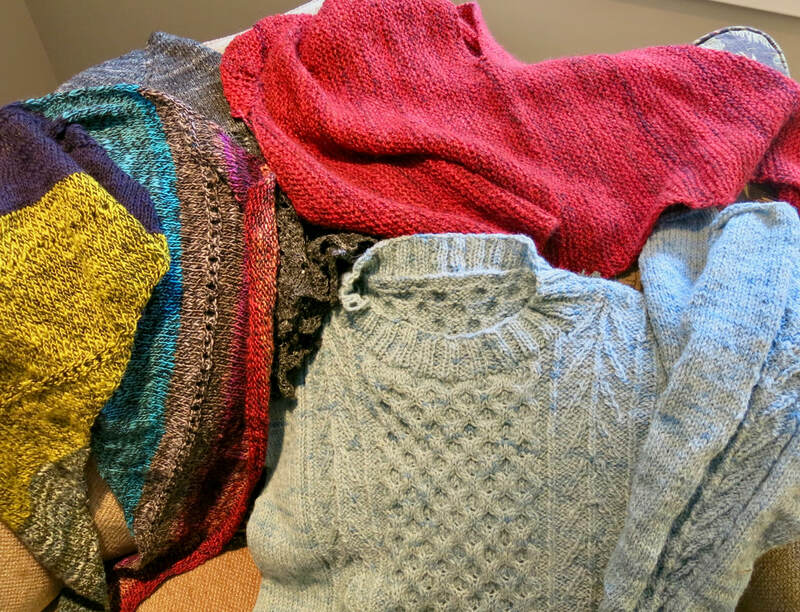 Diane Gray's knitted treasures including Honeycomb sweater. Photos of April 12 Texere opening at Goward House are below. Fibre art enthusiasts celebrated at the 5-8pm opening on April 12. Many remarkable creations were on exhibit and the sale room was a hive of activity. Along with demonstrations of weaving and warping, a wine and cheese bar added to the festivities. arts writer published in Focus, Yam and Boulevard. This website and its content is copyright of Art Openings, 2009. Written permission is required for reproduction of photos or text.